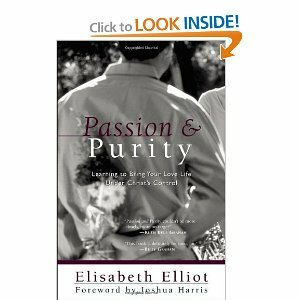 Before I met Jerry, I started trudging through the book “Passion for Purity” by Elisabeth Elliott. She is the widow to Jim Elliot who was one of the martyrs who was murdered by the Auca Indians in the jungles of the Amazon in the late 50’s. Their story was not one I was relishing. She had to wait for him for many years before getting even a commitment of marriage-and all the while, remaining pure in their relationship. In my heart of hearts, it was easier to blow this thing off completely than to have to dangle my heart out there in limbo-land while Jerry was busy making up his mind! I purposed to finish the book that evening and then get my answer from God. I had a tradition from the time I was 14 years old, the year I gave my whole life to the Lord. I would go somewhere to be alone at midnight on new Year’s eve and allow the Lord to speak to me things about the coming year and to pray the new year in with the Lover of my soul, Jesus. I decided I would do just that as it was the appropriate day for it, and after all, I was making good money in my job and could afford it the nice, $50 room at the Hilton. As I settled in, I first called my mom and told her where I was and what I was doing- not that I had basically “run away from home” (a home where I lived alone and could have just locked the door!!) I then called my answering service, the thing we had before cell phones, and told them not to, under any circumstances give out my number where I was. I knew Jerry would be calling after work, like he did most every day to see what was happening and could we get together and hang out. I was just very frustrated that he had come to expect me to be “available” and felt he should have made more plans and “invited me” out to dinner that night, since it was such a special day after all. The underlying frustration was that I wanted to know for sure if this was the man I was going to marry, otherwise, I wanted to get on with my life and God’s plan for me! I nestled up onto the bed of that nice, posh, quiet hotel room and finished reading the last of “Passion for Purity”. I then proceeded to the floor in my most spiritual stance I could muster. Bowed down before God, I cried out to him, “OH God! Show me Lord, Is Jerry the man you have for me?” At that moment, the sweet presence of the Lord came down and His still, small voice spoke to me and said, “Jana, be faithful to him as a friend.” Just as quickly as it came, it lifted and left me feeling anything but sweet! I said, “That’s it! That’s all you have to say to me? You mean I paid $50 to hear you say that? !” I heard what I already knew. To be a faithful friend to Jerry. And to wait. Not to run away, but to allow myself to be vulnerable at a time when it would have been easier to forget the whole thing. It has a horrible, miserable, grueling time- waiting for answers about this man! Angrily, I plopped up on the bed, all spiritual goose-bumps and sense of anointing out the window! I turned on the TV and miserably sat and started watching an old movie when the phone rang. Now originally, I had wanted to make Jerry suffer and wonder where on earth I was! That’s why I told the answering service not to tell “anyone” my whereabouts or numbers. I was beginning to regret that move and as I sat alone watching tv, the phone rang and it was Jerry. He said, “Jana, what are you doing?” I said very smugly, “Oh, I decided to get away and spend some time with the Lord for New Year’s Eve.” Yeah right! I was miserable! “How did you get my number?” He told me the answering service gave it to him. Jerry Lackey can sell ice to an Eskimo! That’s just how he is. He didn’t ask where I was (though only much later, did I realize when they answered the phone, they said, “Hilton, may I help you”. I can only imagine what he must have thought when he realized where I was. We had a pure relationship-something that is possible by the grace of God! He asked me, “Don’t you want to go get something to eat?” I very curtly said, “Well, I guess so. But I would rather come to where you are and we can meet and go from there.” Aware of appearances of evil and all you know! After all, I was in a hotel room!